Value for Money - This model of time attendance was designed to be economical in nature, so that you are able to implement FingerTec Solutions at a lower cost. We believe that when it comes to security, there should be no compromise! User Friendly - This biometric model also has icons that function especially for configuration which gives the whole device a more user-friendly feel. Large in Capacity - Don't underestimate the power of the AC100C for it can now store up to 12,000 fingerprint templates and up to 200,000 transaction logs! 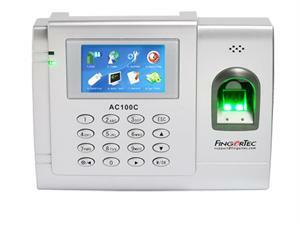 Practicality - The AC100C contains just the amount of features that you need (Eg: 1:1/1:N verification, password, work codes, etc.) ensuring that you don't pay for any unnecessary aspects that you won't be using. Eliminate "Buddy" Punching - The weakness with the clock-in card system is that "buddy punching" can occur where one employee can clock in the time for another employee if any of them are late. Eliminate this occurrence by using the unique-per-individual fingerprint as a clock in card!